Today I have two beautiful polishes sent to me for review by Color4Nails. These are Alanna Rennes in Ablaze and Pacific. You may not have heard of Alanna Renne before and that's ok, she's an indie maker in Australia! Previously her polishes were pretty much impossible to get overseas. However, Color4Nails has started carrying these beautiful polishes making them available to us here in the U.S.
Color4Nails was an extremely successful polish seller on Ebay. They are currently building their own website here and will be up and running soon. For the time being you can order from Color4Nails by emailing them your inquiry at support@color4nails.com. Now to the goodies! I was immediately drawn to Ablaze. 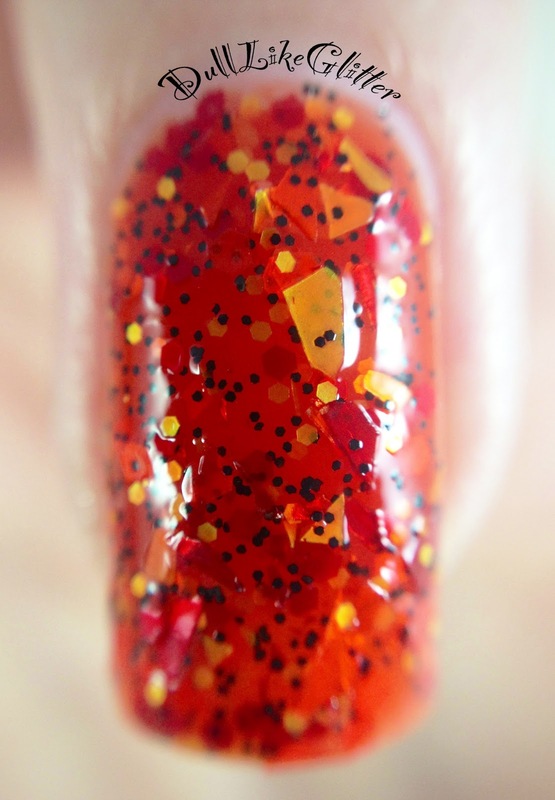 This polish is a fiery orange jelly base full of small yellow and red hexs, black hexs and yellow and red shatter glitters. There are soooooo much glitters in each bottle. One coat gave me a lot of volume with all the glitter and then I added a second just to cover up my nail line and I was good to go. Using the dabbing method to get the glitter coverage even will help with this one. With Ablaze a glitter tamer top coat is a must! The shards in this really do make my nails feel like they're on fire. It is a must see in person. My favorite part about this polish is how unique it is! 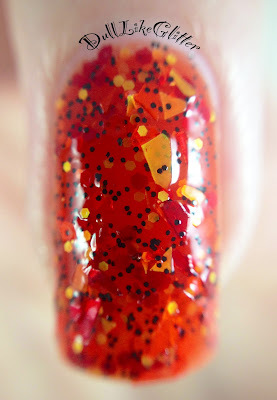 I can't think of a singe polish even remotely similar to this. Why are all the most amazing indies from Australia ? There must me something in the water over there. This macro shows you just how much glitter is packed in here. This was only two thin coats! This polish makes me want to be Katniss for Halloween just so I can wear this for the occasion. Pacific is the next polish! This is a deep blue jelly base with large blue and holographic turquoise hex glitter, turquoise bar glitter and small silver holographic glitter. I got a nice coverage with two coats. It wasn't as densely packed at Ablaze. 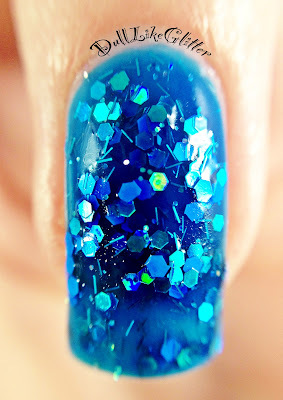 If you want more of a deep blue sea look you can use more coats for a more layered jelly sandwich. With two coats you could still slightly see my nail line. I liked the glitter scattered like this. It reminded me of a pod of dolphins in the ocean. The formula was beautiful and I got all types of glitter on the brush every time I dipped in. I really love the holo glitters in this mix. They wink at you in the light. You can check out the macro to show what I mean! Overall both Alanna Rennes Ablaze and Pacific are gorgeously complex indies. The formulas are fantastic and the combinations are unique. Now that these are available in the U.S. from Color4Nails you don't want to miss out on these beauties! 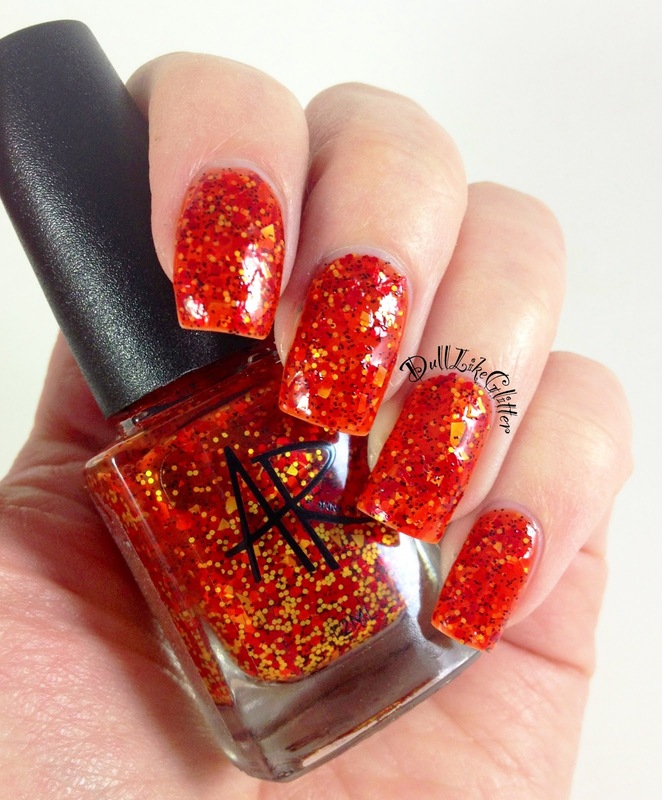 Also make sure you check out some other Alanna Renee polishes. She has some really unique beauties with some wonderful inspirations. Black Cherry? Sandpit? Butterbeer? I want to try more!